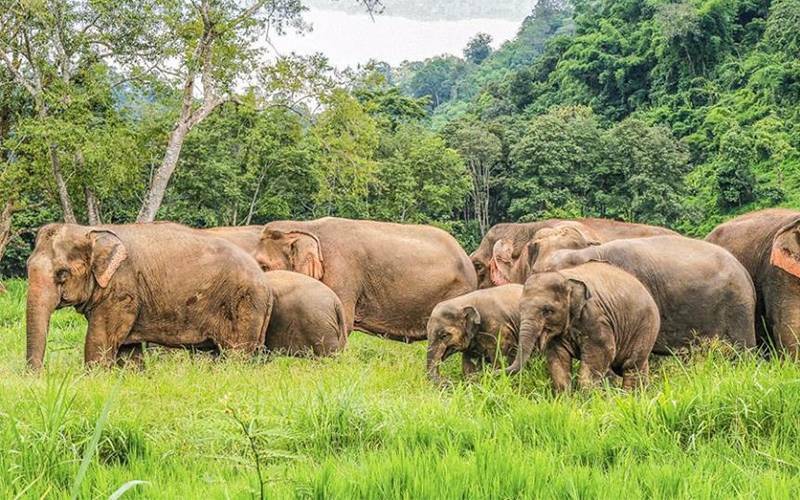 When it comes to a getaway for all lovers of nature who want to stroll around in a more rustic fee environment, Chiang Mai is a perfect choice! Once the idea of going to Chiang Mai hits you, then this Must-Do list must be in your possession! Regarding weather, November to February is the best time to come to Northern Thailand. The period between these months is the coolest and driest in the whole year. As earlier recommended, the most comfortable period to visit Chiang Mai is between Novembers to Februarys of every year. The temperature during the day is approximately 25°C (77°F) during the rainy days. Apart from that, the Loi Krathong Festival is held in November of every year meaning that if you want to be part of this great carnival, get on a flight in November! This is another exciting time to visit Northern Thailand especially for those who love the hot weather! Average temperature during this period is around 40°C (104°F). Although may not be the most comfortable time for the majority of the tourists who have an allergy to hot weather, but the Songkran Festival or the Thai New Year (celebrated every April) that is accompanied by a giant water fight can be thrilling! One of the main points of attraction in Chiang Mai is the Ancient City! A long time ago, several old cities existed across Thailand, but out of all these cities, only Chiang Mai still has its walls still intact. The town inside these old fortifications has fascinating lanes where you can walk and explore. Your exploration of the city can start at the Tha Phae Gate. From there walk by some of the ancient and gorgeous looking temples and explore some marketplaces too. Enjoy yourself at the Loi Krathong Festival which is a Siamese festival observed annually all over the Thailand Kingdom and neighbouring kingdoms with significant south-western Thai cultures. The festival is a 3-day celebration that has fun-filled activities like spiritual activities, street processions, and cultural events, in November of every year (confirm the dates before you travel). Be a partaker of this great experience and enjoy the remarkable moment with lanterns being released into the dark sky. 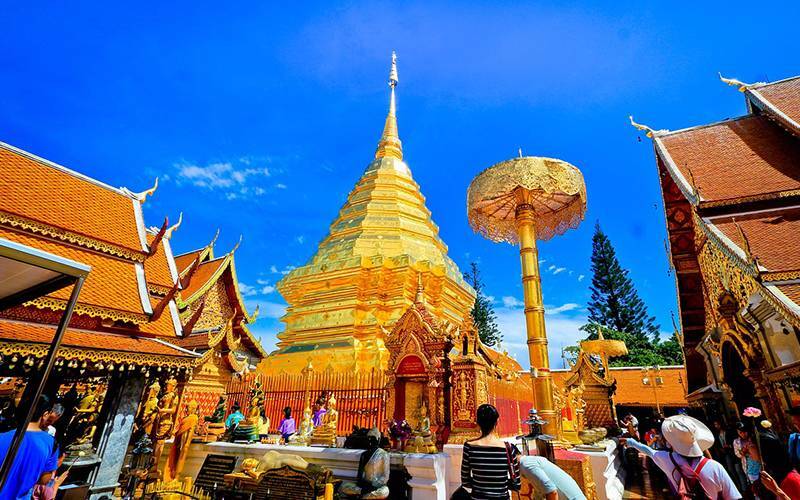 The most notable temples in Chiang Mai is White Temple and Doi Suthep. 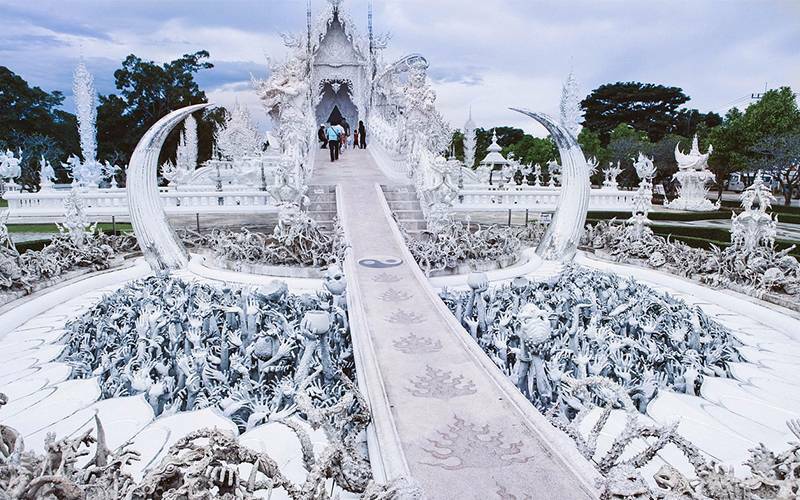 Wat Rong Khun, also known as the White Temple, is one of Thailand's most famous temples. With all the buildings are purely white, it looks like being placed on earth by a god. Your Thailand trip can never be complete without a real Thai massage experience. What makes Thai massage in Chiang Mai uniquely deferent is that you can have it done for you by a prison inmate! The Correctional Institution for Women has extendedly set up for a reintegration program where the female jailbirds are given another chance of becoming productive members of the society. Get an adrenaline day through ATV, explore local Karen Long Neck Tribe, Elephant Village Rafting, Zipline, & Fabulous Sceneries. For a complete guide on all the activities you be involved with on your Thailand trip, check out the UME Top 10 Things to do in Chiang Mai. Unlike Bangkok, Chiang Mai is not a megacity, but there is a lot of things you can still do right here. Aside from that, the city is one of those destinations that attract slow travel. Even if you miss the Yee Peng or Songkran Festivals, you still have up to 3 whole days to explore the city which will give you enough time to do all you plan to do in the city as shown in this guide! One of the major things on your Chiang Mai itinerary is a place to stay during your stay. Luckily, there is a wide array of places where you can visit in Chiang Mai – ranging from the economic conscious traveler hotspots to the uppermost standard of luxury. Below are the available options to you based on your purse. If you're going to splash out on somewhere to stay while you're exploring Chiang Mai, the Dhara Dhevi is astonishing! Another excellent choice is the 137 Pillars House. Both of these properties have stunning grounds; their Thai architecture and charm are spectacular. Mid-Range: you can get good mid-range lodging house options in Chiang Mai at the BED Phrasingh (adults only) or U Chiang Mai. Kate and Hasu Boutique have all of the creature relaxations of a luxury hotel but at a reasonable cost. Equipped with modern rooms, swimming pool, a gym and chic not to mention, there's also a rooftop lounge and a perfect central location, you would never guess that the rate is about $50 per night! It's so appealing – check it out! Chiang Mai is the abode to one of the best global night markets but, you can easily find astounding food booths almost anywhere you go all day long. Chiang Mai food occupied a place in our hearts with its deep flavors and generous usage of chili peppers. Going away from the classic Chiang Mai restaurants and you will fall in love with the Thailand food too. 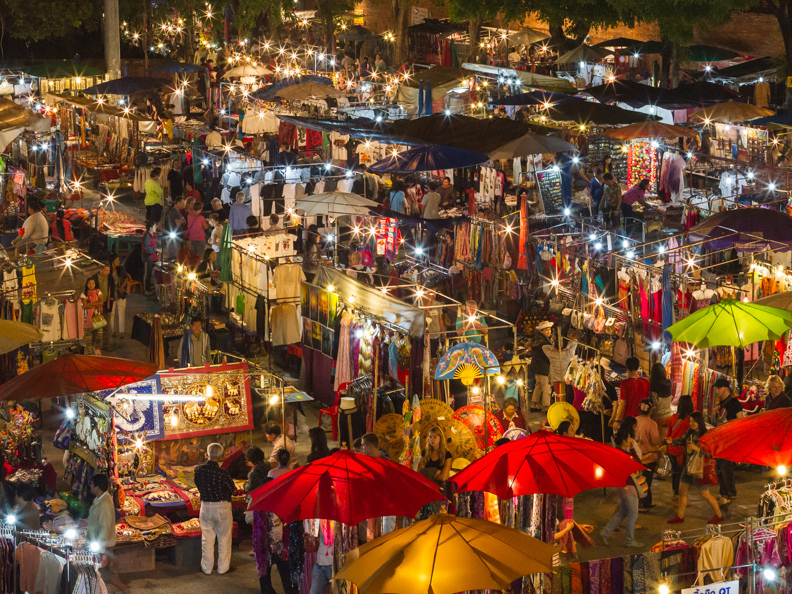 Night markets are passionately famous from the considerable weekend Chiang Mai night bazaar inside the walls to Chang Puak by the Elephant Gate. Night markets get all that you can imagine as a food enthusiast in addition to two of the most significant local street food favorites, that is, meat on a stick and Khanom Krok. Khao Soi is a dish that you must taste while in Chiang Mai. If you have just one meal in Chiang Mai, it must be Khao Soi. If you only have two meals, then Khao Soi should be your choice again. Khao Kha Moo is a prevalent Chiang Mai dish, and nobody does it better than the renowned “Cowboy Hat Lady” inside Chang Phuak night market. We challenge you to discover a better value for a dollar than this plate of deliciously stewed pork leg served over rice with an egg and flavourful sides like pickled mustard greens and garlic chilli sauce.